I threaded up the loom for the 8-end and 12-end satins today, straight draw.Â It went pretty quickly (I only had 390 ends to cope with), and I started thinking about the sett.Â By my calculations, the sett for a 12-end satin in 60/2 silk “should” be about 88 epi, but I added another 10% because I wanted it to be a little warp-emphasis, since the long warp floats would be more reflective (I thought) when running vertically, and warp-emphasis fabrics tend to drape better.Â So I set my calculations for 96 epi, which I thought might be too high – it’s more than double any sett I’ve used before! 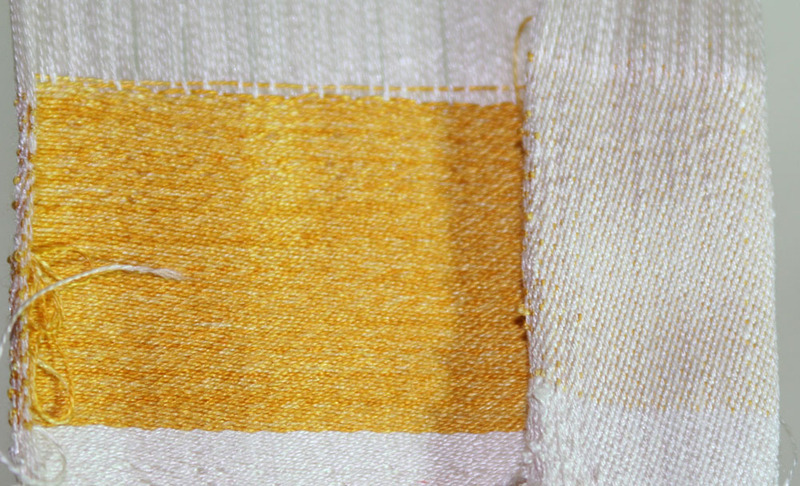 You’d have to zoom in to see it, but you can see that the yellow weft-dominant side shows no white at all, but the white warp-dominant side shows little flecks of yellow.Â What this says to me is that the warp is still not sett close enough – the weft shows slightly on the warp-dominant side.Â I also haven’t counted, but I suspect that the picks per inch are more than the ends per inch – the weft floats look longer than the warp ones, and they should in theory be equalÂ – another sign that the sett is too loose.Â I never thought I’d see the day when 96 epi was too loose! Of course, it could change after wet-finishing, so I don’t really know – I’m trying sternly to resist the temptation to cut off the measly inch-and-three-quarters that I’ve woven so far and plunge it into water.Â A sample that size really isn’t going to give me the information I need, so I need to keep weaving until I have a sample large enough. Alas, my loom is acting up again – this time shafts 20 and 24 are misbehaving, but in some very strange and sporadic ways – so I can’t get any more weaving done tonight.Â I’ll call AVL again in the morning.Â I love this loom, but it can be a bit fiddly. I think that, if this sample doesn’t look more warp-emphasis upon wet-finishing, I will re-sley at a closer sett, like 105 or so.Â That, conveniently, is 7 ends/dent in a 15-dent reed.Â Hopefully that will be enough! Okay, I am a bit confused as to what you are looking for here…Totally one-dimensional fabric (all weft- or all warp-faced?) because I thought satin was defined as you have woven it here, with occasional tie-down threads somewhat randomized. I thought with this structure, they have a minor presence, but it does not disappear completely. And yes, I would certainly weave up a sample big enough to wet finish before making a final verdict on sett. The fascinating thing about weaving is that we are pretty intimate with our projects while at the loom. But when it becomes a garment, household goods, or a piece that hangs in a museum, the scale suddenly changes, and it sometimes looks way different than from our loom-bench perspective.